Koko Taylor, dubbed the ‘Queen of the Blues,’ was one of the most revered female blues singers in history. She was born Cora Walton on September 28, 1928 in Bartlett, Tennessee to sharecropper parents who nicknamed her Koko for her love of chocolate. It was on the plantations where she grew up that she developed her love of music, listening to the gospel of the churches and artists such as Memphis Minnie and Bessie Smith. By the age of 11, Walton was orphaned and she continued to pick cotton, receiving little formal education, until moving to Memphis to clean houses. In 1952, Walton and her future husband Robert ‘Paps’ Taylor moved to Chicago with only “35 cents and a box of Ritz crackers,” (in their own words). In Chicago, Koko, now Mrs. Robert Taylor, continued to clean houses, but increasingly became absorbed with Chicago’s blues scene and she began to sing with the local bands of the nightclubs. In 1962, Taylor was spotted by composer Willie Dixon and he quickly arranged for her to be signed to Chess Records. Dixon also produced her 1965 hit ‘Wang Dang Doodle,’ which was arguably her most popular record. In 1967, she visited Europe as part of the American Folk Blues Festival, marking the beginning of her international appeal. In 1969, when Chess Records was faltering, Taylor’s contract was terminated and she was forced to return to domestic service. But in 1975 she signed with Alligator Records with whom she would release nine albums between 1978-2007, eight of which were Grammy nominated. Taylor also appeared in films, such as Wild at Heart and The Blues Brothers, and made countless television appearances. She also received more blues music awards than any other artist, male or female. In 1993, she received the Legend of the Year Award and March 3rd was declared ‘KoKo Taylor Day’ by Chicago Mayor Richard M. Daley. In 1997, she was included in the Blues Foundation’s Hall of Fame and in 1999 was awarded the Blues Foundation’s Lifetime Achievement Award. Throughout her career, Taylor performed with such musical legends as Muddy Waters and B.B. King. In 1989 Taylor was widowed and in 1996 she married Hays Harris. 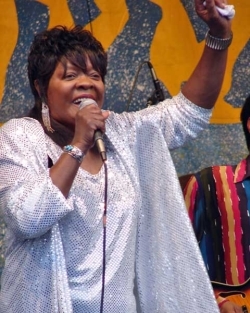 On June 3, 2009 Koko Taylor died in Chicago, leaving behind a daughter, two grandchildren, and three great-grandchildren. Koko Taylor Official Website, www.kokotaylor.com, (Koko Taylor, 2004-2009); Guardian newspaper Official Website, guardian.co.uk, (Guardian News and Media Limited 2009).